NEW BRITAIN - The Iwo Jima Survivors Memorial Park, the only monument in the country built by survivors of the World War II battle, is now under siege itself as two factions of the foundation that maintains the grounds are battling for control. The monument honors the 100 military personnel from Connecticut who died in the battle of Iwo Jima, fought by the Marines in 1945 to take control of the small Pacific island from the Japanese. 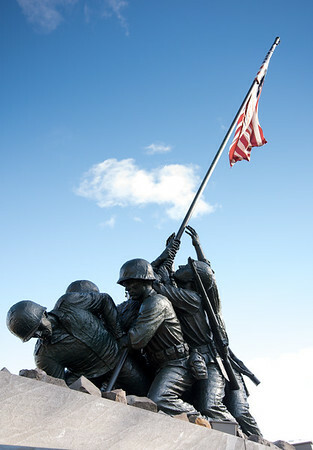 The statue is based on the iconic photograph of the Marines raising the American flag on Mount Suribachi. The park also includes 100 American flags, one for each of the Marines from Connecticut who died. Mark Adamski, the former president of the Iwo Jima Memorial Historical Foundation, admitted to The Herald on Aug. 29 that he had arranged to have the kiosk “removed,” as it was his right as the foundation’s board president, and that he also had his father nail the kiosk shut to prevent “inappropriate” materials from being placed inside. The newly installed elected officers of the board called police to report the theft and what they considered yet another act of vandalism they allege is part of a longstanding feud with Adamski, who refuses to acknowledge the newly elected board. New members of the executive board of the nonprofit foundation said that since Adamski refused to step down and hold new elections in 2016, there has been a battle for control of the foundation and the memorial. “His term ended in 2016. Our officers are only a two-year term. When your term is up, you are done,” Roy said. Roy had called police after the lock to the kiosk had been repeatedly broken and the information tucked inside on the new officers disappeared in early August. Roy also called police when he and his wife photographed Adamski’s father nailing the kiosk shut on Aug. 25 and again when the group realized the kiosk had been ripped out a few days later. Detectives say they believe the disappearance of the kiosk “was not a random act” and the case is still under investigation, police Capt. Jeanette Portalatin said. Adamski said he “had checked with the executive board and they said to secure it,” but he declined to name which board members approved the actions. Adamski also said he arranged to have a marble bench removed, which the new officers thought was stolen, because “third parties” had something etched on it that was not approved by the board. Adamski also declined to name the “third parties,” what was etched on the bench or what was on the “inappropriate” materials he had removed from the kiosk. The materials had the names of the newly elected slate of officers, Roy said. The bench was etched in the memory of Frank Zuraski, an Iwo Jima survivor who died while clearing brush to make way for the memorial in 1994, Roy said. Roy and Zuraski’s family have asked Adamski to have the bench put back. “It’s just one thing in a long line of issues we’ve had with him,” Roy said. “To the best of my knowledge I am still listed as president on the Secretary of the State’s website,” Adamski said. Adamski said he was forced to “suspend” the elections of new officers and meetings since at least 2016 “due to an ongoing investigation” on which he wouldn’t elaborate. He also said he was charging the foundation for mowing the 2.5-acre lawn of the park, which he equated to the payments the foundation makes for electricity and gas to keep the eternal flame at the park flickering. Adamski referred all comment about the “ongoing investigation” to his attorney Michael Broderick who did not return phone calls to The Herald. The foundation had been in disarray for months when lawyer John Caruso, a former judge whose brother was an Iwo Jima survivor, stepped in and recommended wresting control from Adamski by electing new officers and taking Adamski’s name off bank accounts. As the newly elected treasurer, Caruso now has control of the group’s money, which is used to pay about $20,000 in expenses a year to maintain the park. The monument was dedicated on Feb. 23, 1995, the 50th anniversary of the battle, after a group of Iwo Jima survivors raised $400,000 and cleared a patch of land donated by CCSU The next year, the survivors formed the Iwo Jima Memorial Historical Foundation to maintain the property. Posted in New Britain Herald, General News, New Britain on Tuesday, 4 September 2018 20:20. Updated: Tuesday, 4 September 2018 20:23.